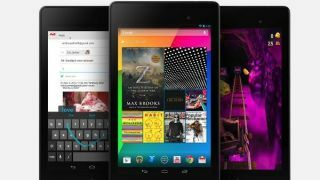 Google's new Nexus 7 is now available to buy in the UK, just as Asus said it would be when it confirmed the date earlier this month. You can go grab the tablet directly from the Google play store right now. The Android 4.3-toting Nexus 7 costs £199.99 for the 16GB version and £239.99 for the 32GB model. While the device is yet to hit other retailers, O2 has announced that it will have the new Nexus 7 in both Wi-Fi (for £249.99) and 4G-ready versions (for £319.99). O2 says that the 4G version will be available from September 13, however it's not yet confirmed anything on data plans. We're following up and will let you know if we hear more. Currently the device has a shipping time of 1-2 days from the Play Store, but remembering how quickly the original Nexus 7 sold out, we'd expect this to hike up quickly. The 7-inch tablet has a full HD (1920 x 1200) display, 1.5GHz quad-core Snapdragon S4 Pro processor and 2GB of RAM.